Foreign aid is supposed to go to foreign countries. But there are many grey areas in terms of what can be counted as aid, and who can be classified as a recipient. Figures on total aid to education, for example, suggest France is a top performer: it was the largest bilateral donor to education in 2009 (the latest year for which data are available) with $1.9 billion disbursed. But only a quarter of this sum goes to developing countries. The rest essentially stays in France, or directly benefits French citizens. Such practices should come under scrutiny on Wednesday at a panel discussion in Paris on French aid, featuring Melinda Gates, co-president of the Bill and Melinda Gates Foundation. The panel debate at the social science college EHESS (École des hautes études en sciences sociales) has been convened by the advocacy network ONE in collaboration with the news website the Huffington Post and the French think tank IDDRI. Only a quarter of French aid to education is spent on developing countries' education systems. For several years in the Education for All Global Monitoring Report we have highlighted the fact that the majority of aid to post-secondary education from France, Germany and smaller donors such as Austria or Portugal goes to “imputed student costs,” or the cost of educating developing-country students in institutions in donor countries. As the figure here shows, in 2009 half of all French aid to education was channelled to French higher education institutions that way. Of the remaining half, a good chunk goes to two French “overseas collectivities,” a unique status between an overseas department (officially part of France) and an independent territory. Mayotte, an island in the Indian Ocean, became an overseas French department in 2011, and in the years running up to this change of status, France poured millions into its education system. From 2011 on however, assistance to Mayotte will not be counted as aid because it was removed from the OECD’s Development Assistance Committee’s list of aid recipients following its graduation as a département. 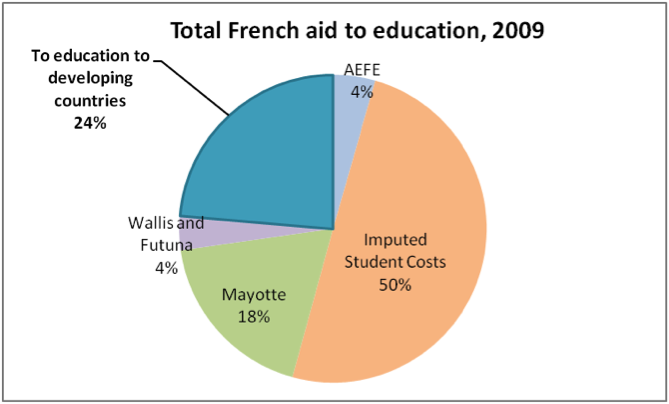 Since Mayotte received 18% of all French aid to education in 2009, this may lead to a significant drop in 2011, unless the funds are reallocated. Wallis and Futuna in the South Pacific is still an overseas collectivity, and in 2009 received 4% of all French aid to education. This is equivalent to around $4,400 per island inhabitant. What of aid to secondary education? Here again, French aid mostly benefits its own citizens. Around $83 million – 62% of aid to secondary education that does not already go to overseas collectivities – went to the Agence pour l’enseignement français à l’étranger (AEFE), a network of French overseas schools for French children living abroad. Why these funds counted as aid is puzzling. What is left for education systems in developing countries? France still spent US$440 million in 2009, so even considering the numerous questionable items that it counts as aid to education, it remains an important donor to the sector. Removing those items would move it from first to sixth most important bilateral donor to education. France is also not guilty of misreporting, as it is following OECD-DAC guidelines. But it is crucial to ensure that aid resources are used to strengthen education in those countries most in need. There are still 67 million children out of school, and global aid to education is vastly insufficient to give them a chance to learn. In addition, some other key donors are cutting back their support, as we discuss in a recent policy paper. This entry was posted in Aid, Basic education, Developing countries, Donors, Finance, Governance, Out-of-school children. Bookmark the permalink.